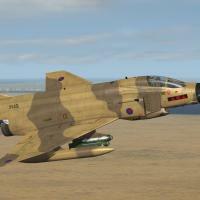 Complete standalone aircraft; F-4M_GA [Ground Attack]. Single seat Spey powered F-4M, A/G only , built in ECM & FLIR, 2x 30mm Aden cannons, more weapons capabilities than "normal" F-4M.......go kill something!! Also, bonus item added at last minute.